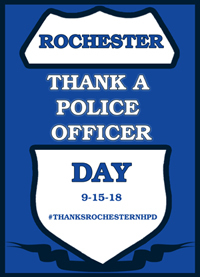 Join the Greater Rochester Chamber of Commerce, Rochester Rotary Club, Holy Rosary Credit Union, American Legion Unit 7 Women's Auxiliary and Rochester Main Street in a city-wide celebration to "Paint the City Blue" to show our appreciation of our local police officers on September 15, 2018, which is National Thank A Police Officer Day. Public spaces will be decorated with blue ribbons, bows and lights including the Rochester Commons, Parson Main, downtown light poles and green space along a portion of Columbus Avenue. Portions of other arterial roads including Wakefield, South Main, North Main Streets will also be decorated. Many are volunteering to help with this effort and some of the local schools are developing artwork that will be displayed at several downtown businesses. 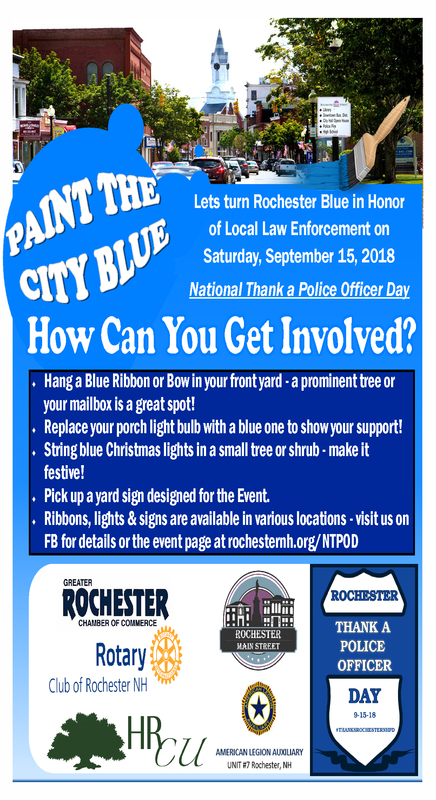 This group invites residents and businesses to join them in thanking members of the Rochester Police Department by hanging a ribbon or bow in your front yard on a tree or on your mailbox, replace a porch light bulb with a blue one, string blue Christmas lights on a small tree or shrub, put up a yard sign or anything else in the spirit of the event. The group has purchased for distribution a limited number of bows, light bulbs and yard signs. These are available at the Greater Rochester Chamber of Commerce at 18 South Main Street, Granite Steak & Grill at 11 Farmington Road and Holy Rosary Credit Union at 133 Brock Street in Rochester. These items are free, but donations will be accepted. All proceeds will be applied to additional supplies and any excess funds will be donated to the Rochester Police Benevolent Association. Rochester Rotary Charities is acting as the fiduciary for the coalition. Thank You card stations have been set up at various locations in the city. Each week, these locations rotate, so check the facebook page to see where they are. 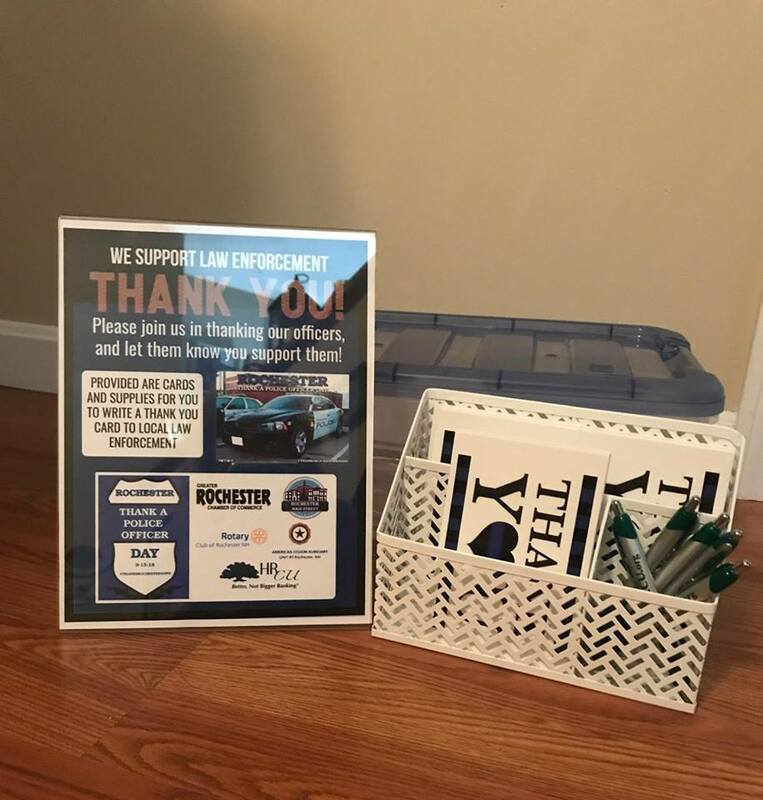 Stop by and fill out one of our "Thank You" postcards, or drop one of your own personal "thank you" cards off for our men & women in blue! 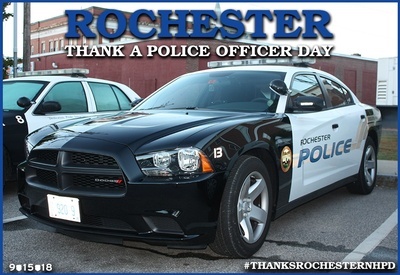 Thanks Rochester NH PD is a community-wide celebration to thank Rochester Police officers for all they do protect and serve our community.